I’m pretty sure that by now, everyone reading this blog has heard of or probably even played Minecraft himself. It’s a sweet little game that tosses you into a simplified world that you can freely (and easily!) shape in any way you want. Your tasks: feed yourself, keep monsters out of your buildings and build something remarkable. Minecraft can, of course, be played with any number of players online. All you need is a server with shell access and Java on it. If you also have Mono on your server, you can use McMyAdmin, a very convenient web frontend for the Minecraft server to manage users and perform automated backups. In spring this year, I began work on a moderately sized business application. The time from learning what the program should do to the first prototype were less than 2 weeks. To pull it off, I basically ditched any sane development practice and started throwing code at the problem as fast as I could. The application required a client/server model and the server had to store its data in a database. At that point in time, I knew about ORMs but had never used one before, but hoping for the best, I picked Microsoft’s Entity Framework because it had a visual designer and looked like I could just drag & drop my data model together and then figure out how to perform queries. It fell flat when I noticed that I could only choose between TPT (Table Per Type) and TPH (Table Per Hierarchy) globally for the whole freakin’ model. So I tried NHibernate and quickly rebounded due to its learning curve, resorting to writing SQL queries myself and loading them into objects with a very basic class mapper that I had written for another, much smaller project some time ago. A few hours ago, I uploaded a new release of the Nuclex Framework to CodePlex. There has been an intermediate release, R1323, which I didn’t announce here because it was more or less just a stop-gap measure to stop reports for issues in the old (old, old) R1242 release where my Nuclex.Input library was still subclassing XNA’s Window. Thanks to a generous contribution by Adrian Tsai, the TrueType importer now accepts standard Windows font names – this is a big step towards being a drop-in replacement for XNA’s own sprite font importer. The TrueType importer now lets users choose different hinting algorithms. No hinting will result in MacOSish blurred text that stays true to the font’s metrics. The auto hinter from FreeType is a nice compromise between forcing strokes into a pixel raster for sharpness and retaining the font’s look (and imho the best option). Native will produce a perfect match with Windows’ font rendering, producing sharp letters that may deviate from the font’s actual metrics a bit. You can now decide whether SpriteFonts imported by the TrueType importer are centered on their baseline or on their upper end (like XNA). This, together with the improved font name lookup turns the Nuclex TrueType importer into a 100% drop-in replacement for XNA’s font processor. Nuclex.Input’s game pads now provide a method .GetExtendedState() with which you can access all of DirectInput’s 128 possible buttons, 24 axes and 8 sliders. I designed this so that there’s zero overhead if you don’t use the .GetExtendedState() method. The ExtendedGamePadState already normalizes axes for you (from -1.0 to +1.0 for axes and 0.0 to 1.0 for sliders) and in general is much nicer to work with than using DirectInput directly! The GUI is now based on the Nuclex.Input library. That will allow me to soon implement TouchPanel input and make the GUI usable on Windows Phone 7. Note that you can easily hack Windows Phone 7 support into a project by converting touch input into mouse input. Due to the modular design of Nuclex.Input, you don’t have to touch a single line of code, simple create your own IInputCapturer! The game state manager has undergone a redesign. Existing projects shouldn’t be in trouble, the redesign gets rid of the GameStateManager reference (you can remember the Reference yourself if you want your states to initiate a transition themselves). Pop-up game states similar to XNA’s game state management example are now supported. Upgraded to NMock 3.0. This is mostly an internal change but it really helps being refactoring-friendly as my unit tests no longer contain method names hardcoded in strings anymore. All assemblies in the Nuclex Framework are now signed with a strong name, this no longer preventing you from signing your own assemblies. And of course, all issues that were reporting through various channels have been fixed — excluding two possible problems I can’t yet reproduce, but will mention here for honesty: the AffineThreadPool might sometimes be skipping a task under heavy load and there might be a problem in the PrimitiveBatch when it is handed large amounts of vertices. I couldn’t reproduce these issues and they’re not occurring in my own game, but if anyone notices such an issue, please contact me! There has been a discussion on the XNA forums regarding a slight decrease in the visual quality of SpriteFonts from XNA 3.1 to XNA 4.0: XNA 4.0 renders SpriteFont differently (and not for the better). There are two changes that might have impacted visual quality: XNA 4.0 uses premultiplied alpha everywhere (whereas XNA 3.1 processed the alpha channel as-is) and, as revealed by "Krome Studios", The FontDescriptionProcessor in XNA 4.0 generates a texture with DXT3 (a form of compression that limits each block of 4×4 pixels to contain only 4 different colors and reduces the alpha channel to 4 bits of precision or 16 levels, see Wikipedia). Because I’ve written a custom FontDescriptionProcessor for XNA 4.0 which outputs compatible SpriteFonts but uses FreeType instead of Windows’ GDI font API, I decided to do a little comparison. 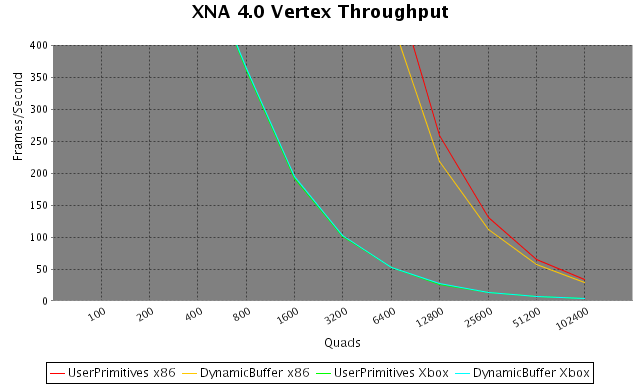 More than a year ago, I did some benchmarking in XNA 3.1, comparing the vertex throughput I could achieve on my GeForce 8800 via XNA’s DynamicVertexBuffer class versus just calling GraphicsDevice.DrawUserPrimitives(). Here’s my earlier benchmark: Efficiently Rendering Dynamic Vertices. In all cases, DrawUserPrimitives() was marginally faster than the DynmicVertexBuffer, but it appeared to be a very bad idea to use a DynamicVertexBuffer on the Xbox 360. I had a really nice discussion with Shawn Hargreaves on the XNA forums where he provided a lot of in-depth information about how things work on the Xbox 360: . One of today’s threads on the AppHub forums reminded me if my earlier benchmarks, so I decided to dig out my old benchmark and redo it in XNA 4.0. The benchmark uses my Nuclex Framework‘s PrimitiveBatch class, which underwent some changes since then, so I repeated the XNA 3.1 benchmarks in addition to getting the new data for XNA 4.0. I just love listening to music in bed, right before going to sleep. You can close your eyes and focus, experiencing the music like a movie and less like the background noise music is often degraded to during the day. After moving my home office to a different floor, however, my bedroom is no longer close enough to my PC to do this (I used a rather quirky solution, using a game pad to remote-control WinAmp and later shut down my PC :D). That’s a Logitech Squeezebox Boom. I admit that I half expected this category of devices to not exist at all, because a “normal” person doesn’t have a home server or a PC that’s always on. And when I found something I expected some half baked showpiece hardware, but was yet again positively surprised. Read on for my personal review of this brilliant device! There’s a new release of the Nuclex Framework available on CodePlex! The new release adds a new library, Nuclex.Input, which is a very lightweight library that adds seamless support for DirectInput game pads and joysticks, well-behaving keyboard text input, event-based input and the ability to mock any kind of input in your unit tests. Instead of firing up your XBox 360 each time, you can now write simple tests that simulate controllers being attached and detached. Also new is full support for XNA 4.0 on x86 and XBox 360. Windows Phone 7 is also supported by most of the libraries. The PC builds all target the .NET Client Profile, allowing you to reduce the footprint of your installer. Special .NET 4.0 client profile builds of the third-party libraries (LZMA, NUnit, NMock, log4net and SlimDX). Of course, all bugs reported since the last release have been fixed! Proponents of dependency injection try to design classes so they can either work autonomously or get all services they rely on handed to them through their constructor. But even without dependency injection, the situation often arises where certain classes need to interact with a lot of other objects. Above class takes care of rendering the visual and audible representations of a RadarBuilding in a computer game. As you can imagine, the same references will be required by other buildings, think TankFactoryBuilding, CommandCenterBuilding and so on – all duplicating the fields, their assignment and the complex constructor. The beauty in this is that the first thing you see is bool isInsideHeightField, prominently positioned at one indent less than the conditions. Your brain registers the purpose of that block of code before it encounters the actual code. The if below is also much more obvious. If the position is inside the height field, look up the value in the height field, otherwise return zero. Almost like reading english. Finally, this level of obviousness eliminates the need for any additional comments in the code!